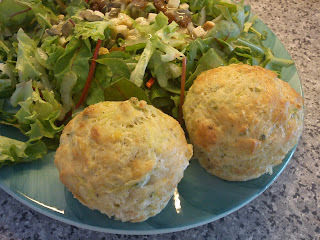 This month's Tea Time Treats theme was super-popular! Thank you very much to all those who entered. So plonk yourself in a comfy chair, grab a cuppa and settle back to enjoy a glorious selection of Muffin, Cupcake and Fairy Cake recipes! Over at the Peachicks Bakery, between feeding a very hungry six week old baby peachick, amazingly there has been time to bake these Mummy's Midnight Muffins. Full of oaty goodness, dried fruit, seeds and sweet honey they sound just the thing for those 3am feeds! Whether you wish to name them mad-uffins, madeluffins or simply mighty delicious Honey Madeleine Muffins, head over to Tales of Pigling Bland for this lovely, dainty recipe! 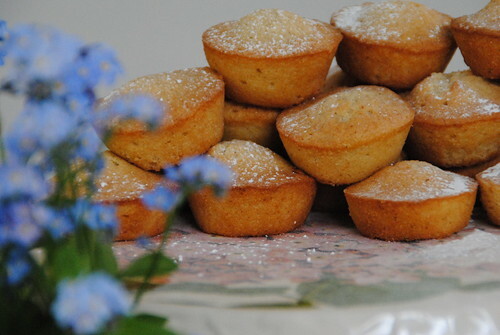 Baking in Franglais describes these next tasty sweet bakes, Banana Muffins as perfect for 'an afternoon in early spring, sitting by the wood burning stove and enjoying a cup of tea because it’s wet and chilly outside'. Lovely! How cute do these cheeky, chubby fairies look on Blissfully Scrumptious' Fairies on Fairy Cakes? Such an inspired and fun bake! 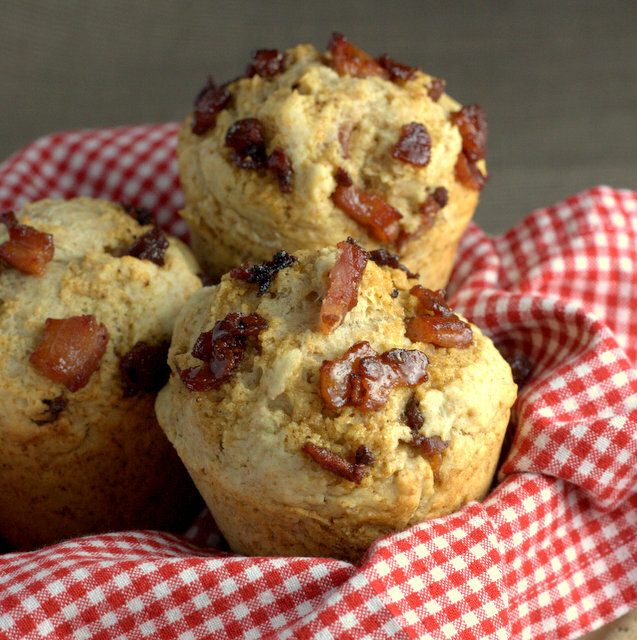 Maple Bacon Muffins? 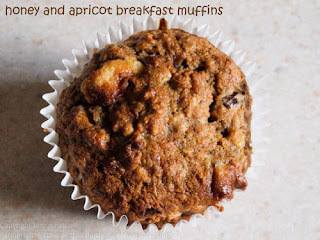 Breakfast in a muffin from Fuss Free Flavours? Don't mind if I do! With crispy bacon and a generous pouring of maple syrup, alongside a cup or two of coffee and the papers these muffins are sure to get you leaping out of bed each Sunday morning! Meanwhile, Caroline Makes has baked not one, not two, but three Tea Time Treats bakes! 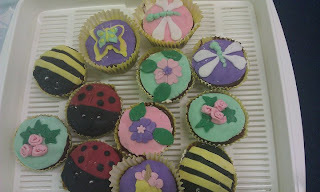 Firstly, this lovely little collection of Flower, Ladybird and Bee Cupcakes. 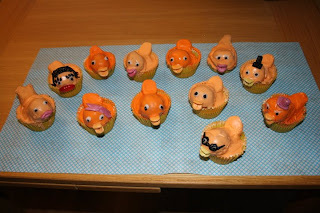 Secondly, a pond full of Duck Cupcakes! And also these rather super USA-inspired Popcorn Cupcakes, complete with the fab little Popcorn container cases! 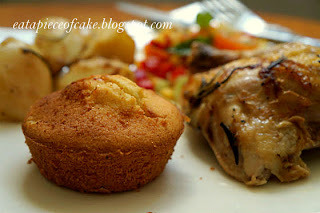 Attempting to recreate a favourite muffin from childhood led A Piece of Cake to bake these Corn Muffins. 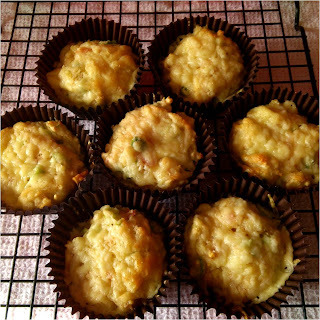 A Working Mum's Cookbook has baked my favourite muffins- Carrot Cake Muffins. 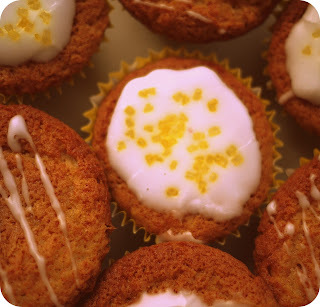 With a delicious hint of orange and sweet, creamy cheese icing- do you do mail order Annie?! Katherine from Lemons and Limoni wasn't initially tempted to make Ina Garten's German Chocolate Cupcakes. Fate, in the form of half a tub of sourcream and a tub of buttermilk, intervened and these cupcakes were a resounding success: intensely chocolately and an instant favourite! Fancy cupcakes bursting with flavour and a trip down memory lane? 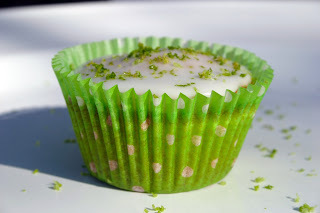 Then head over to Belleau Kitchen for Dom's Lime Sherbet and Rose Cupcakes! 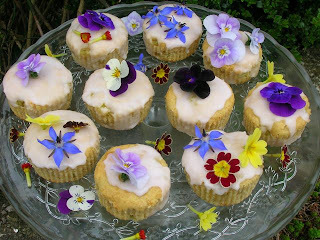 I've always wondered how to put together a Bouquet of Cupcakes- and Gary from Exploits of a Food Nut has explained exactly how to do so in his Bouquet of Cupcakes post. 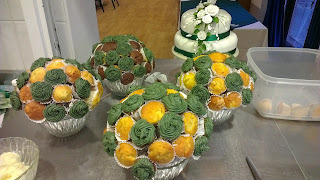 Gary made an impressive 150 cupcakes for a wedding- now there's a lot of icing sugar! 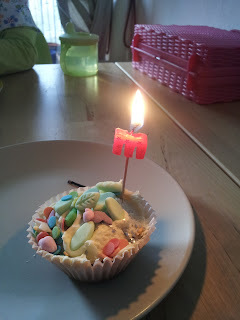 These Dairy Free Yogurt Pot Cakes were entered by Makey-Cakey, a recipe from a French parenting book that suggests using yogurt pots as measuring containers for each of the ingredients. Excellently practical and extra sparkly cupcakes! Celebrating the first day of Spring (at last!) 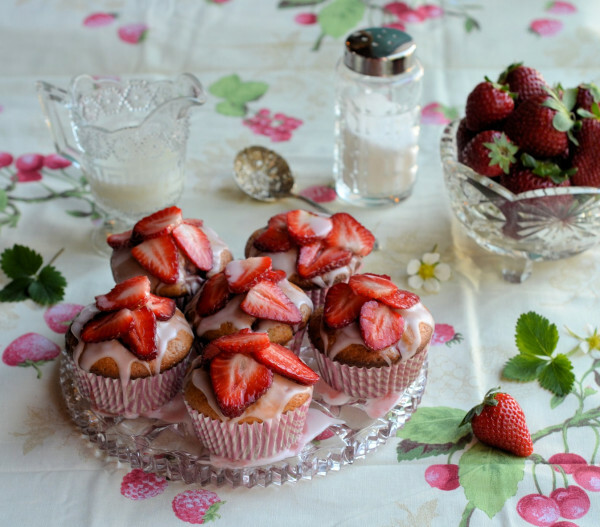 Karen from Lavender and Lovage baked these glorious Strawberry Fair Yogurt Cupcakes- aren't they so, so SO pretty? 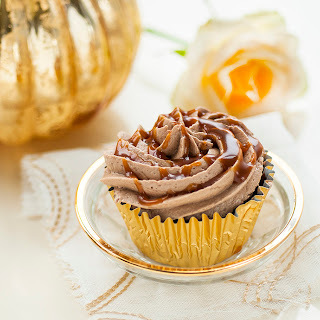 Just wait til you hear the name of this next entry, salivating taste buds at the ready folks as SuperGolden Bakes has created these Black Magic Cupcakes with Baileys Salted Caramel Italian Meringue Buttercream. Wow! Susie has baked these her Amazingly Chocolaty Cupcakes, describing them as 'a soft, fluffy sponge, with a hidden chocolate sauce centre, covered in rich chocolate buttercream'. Susie adds that chocolate is universally popular amongst her boys- with these cupcakes I can completely understand just why that might be the case! 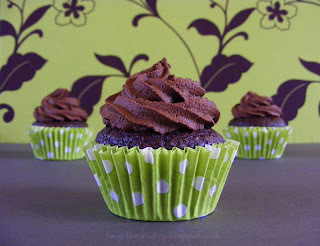 The great thing about this month's Tea Time Treats theme is discovering some really unique and inventive Cupcake flavourings- these Chocolate Cupcakes with Avacado Frosting from Elizabeth's Kitchen are a case in point! These rather marvellous Rhubarb Streusel Cupcakes have been baked by Suelle from Mainly Baking- light, moist cakes with a hint of cinnamon and nutmeg in the crunchy topping. Delicious! Baked as a big thank you for lots of lovely acts of kindness Cupcake Crazy Gem has entered these Double Chocolate Vanilla Bean and Malted Chocolate Cupcakes. And such a lovely egg-box presentation! Inspired by the good ol' U S of A, The More Than Occasional Baker created these Peanut Butter, Honey and Chocolate Cupcakes. Using fragrant leatherwood honey from Australia plus honey peanut butter ensured these little delights were super sweet! Using one of my favourite confectionery items, Under the Blue Gum Tree has baked these marvellous Malteser Cupcakes- I just know if I attempted this recipe I'll have eaten the entire pack of chocolates before getting anywhere near the mixing bowl! Is it a cake or a biscuit? 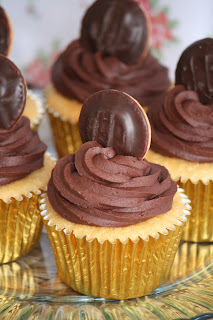 Its the eternal question... and while we decide exactly what a Jaffa Cake is, I'm sure Laura from Laura Loves Cakes will not mind us feasting on a few of these lush Jaffa Cupcakes, complete with a mini Jaff on top! How do you make White Chocolate ...better?! 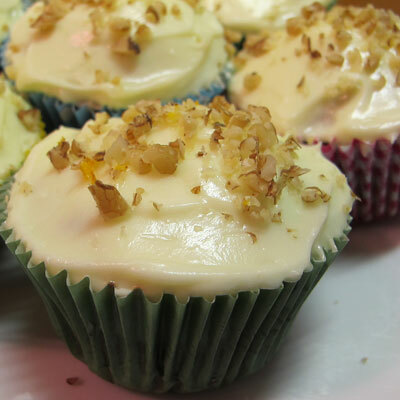 Hungry Hinny shows you how in her fabulous Coffee and Caramelised White Chocolate Cupcakes post. The white chocolate is gently roasted providing a new depth of flavour and a little salt is added at the end ... perfect! Hope you've enjoyed a whistle stop tour of all the lovely entries for April's Tea Time Treats table. And if you haven't yet popped the oven on to start baking one of these recipes, get to it! Meanwhile, head over to Karen's blog, Lavender and Lovage for May's theme. Happy Baking! Wow madeline cupcakes look amazing! Great collection! Awesome! Thanks for doing this. They all look DELISH! Sincere apologies Suelle- its been an exceptionally busy month for me with lots going on but thank you very much for your entry- now added! Thanks, Kate - I'll try harder with the Linky next month, but I'm something of a technical dinosaur! Wauuw for some amazing cupcakes and muffins, giving me plenty of inspiration to bake in my own little kitchen for a nice cup of tea. Kate, I think you've missed number 29 onwards from the linky (I noticed because I'm number 32). I'd love to be added if you have time. Thanks for doing the round up. 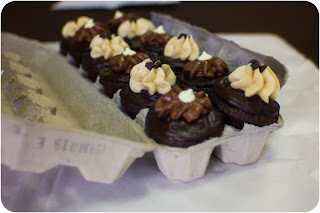 amazing round-up... such an incredible collection of cupcake recipes... nice work! What a fantastic collection of delicious looking cupcakes! Ooh-er. I feel the need of a fairy cake / cupcake party coming on featuring all of these delectable goodies. Thanks for the round-up Kate. Happy Birthday What Kate Baked!